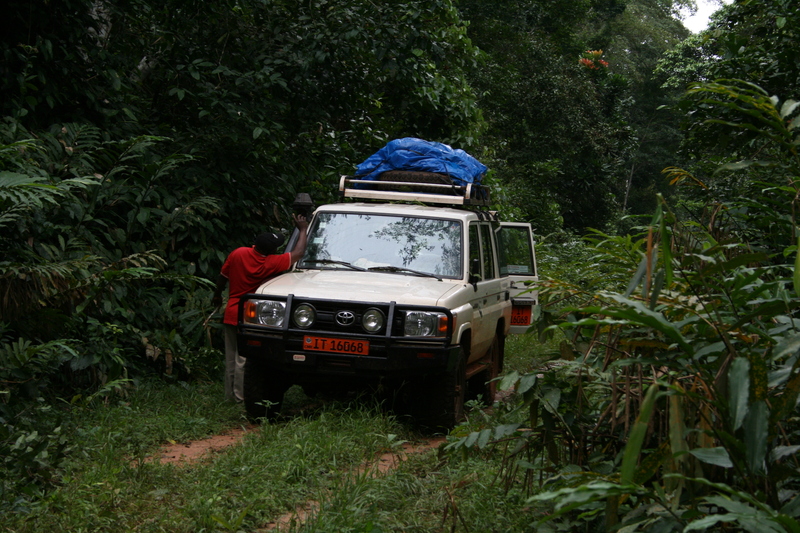 This is the second part of my 2011 travels, which documents a trip to Cameroon and Central African Republic. 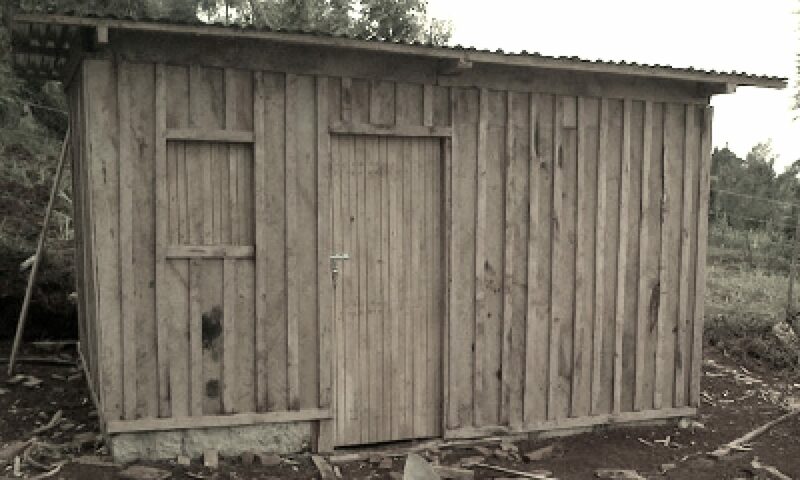 I will let the photos speak for themselves for the most part. 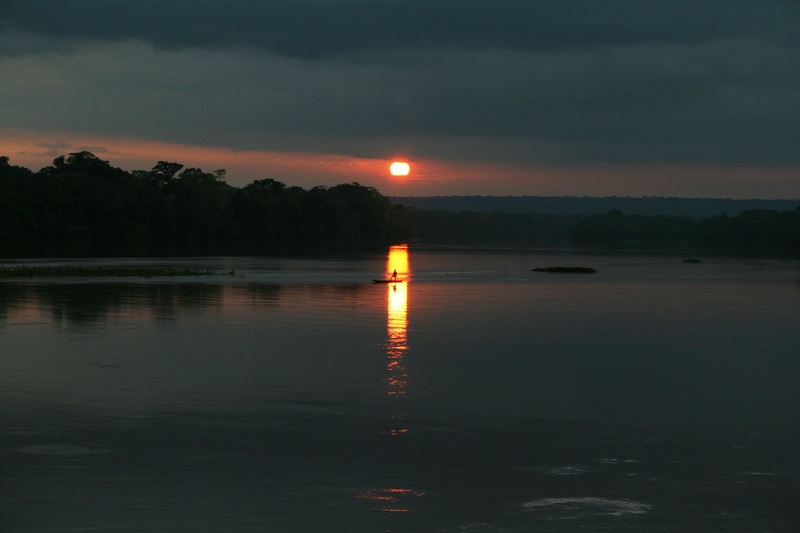 Starting in Yaounde, Cameroon, we traveled by Land Cruiser east to the border area with Central African Republic and then crossed the river by boat into CAR. 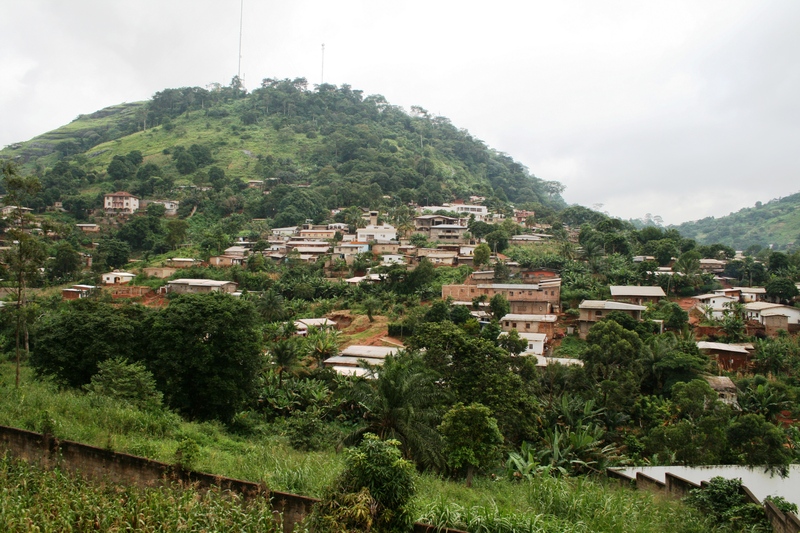 Hills and suburbs of Yaounde, Cameroon. 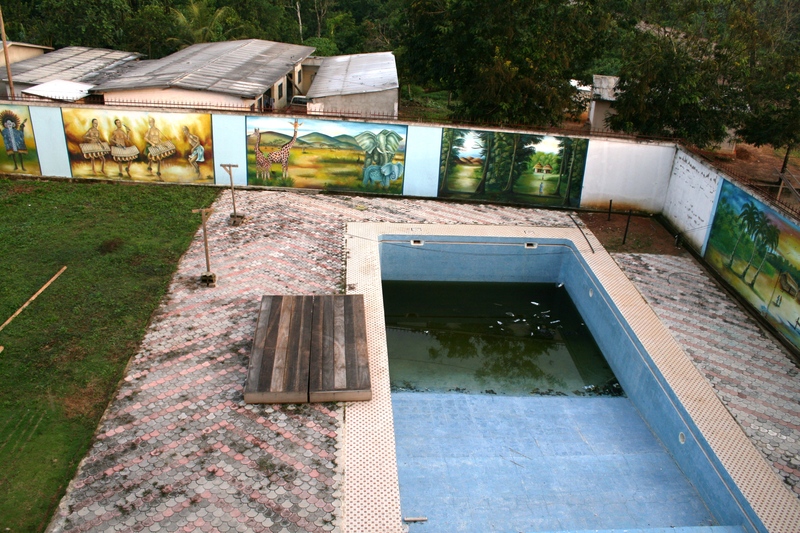 Decrepit swimming pool and lovely murals at a hotel in Yokadouma, Cameroon. 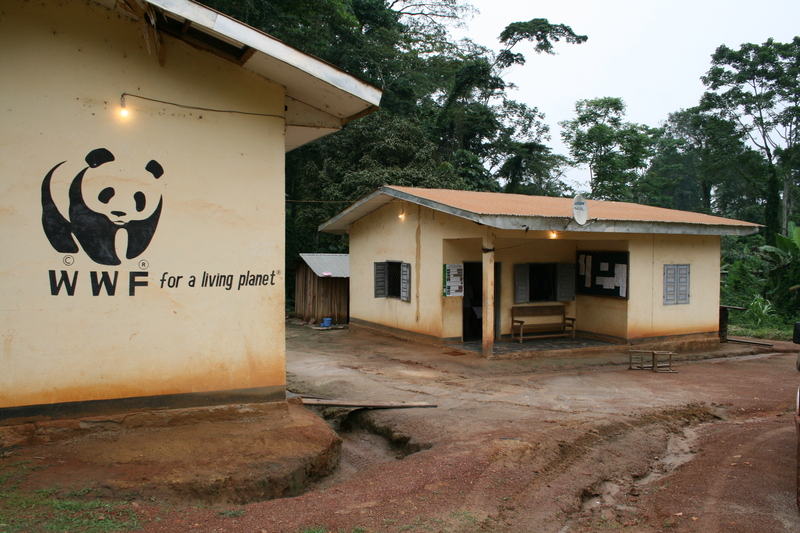 WWF project office in Ngoila, Cameroon. 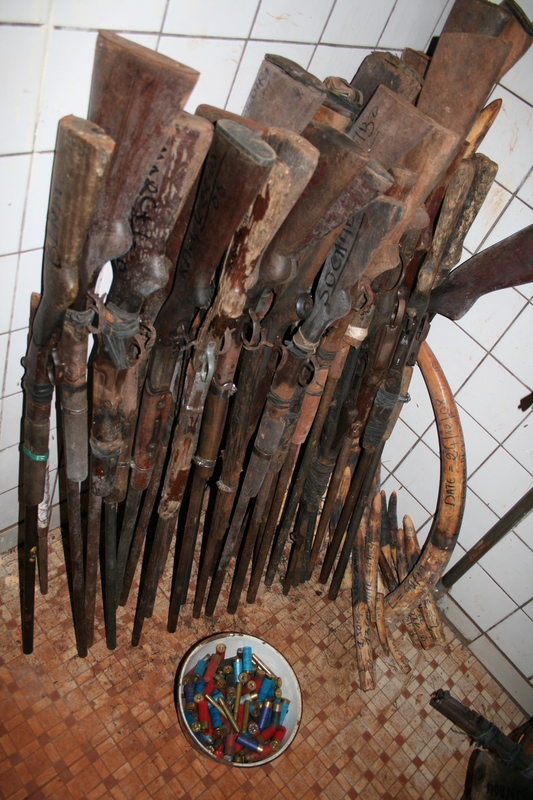 Confiscated guns and ivory from poachers. 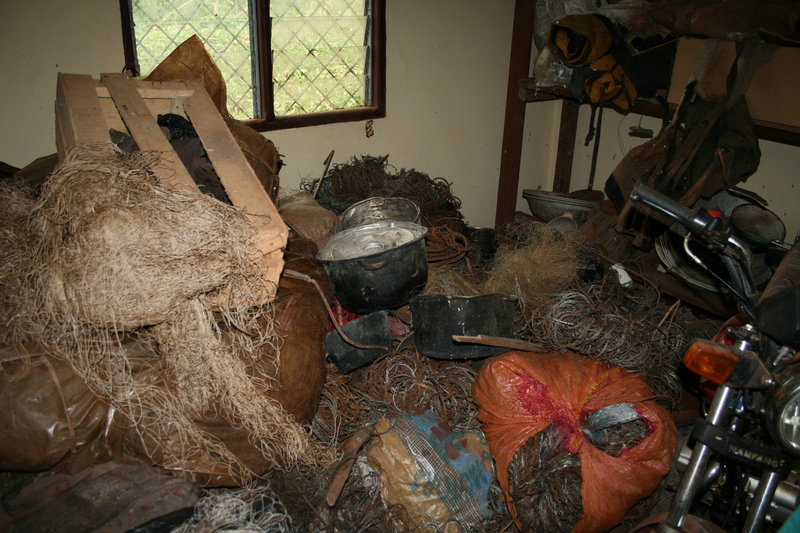 Piles of illegal snares and hunting nets, confiscated motorcycles, chainsaws and other material used by poachers and illegal loggers in the national parks. Homemade ammunition. 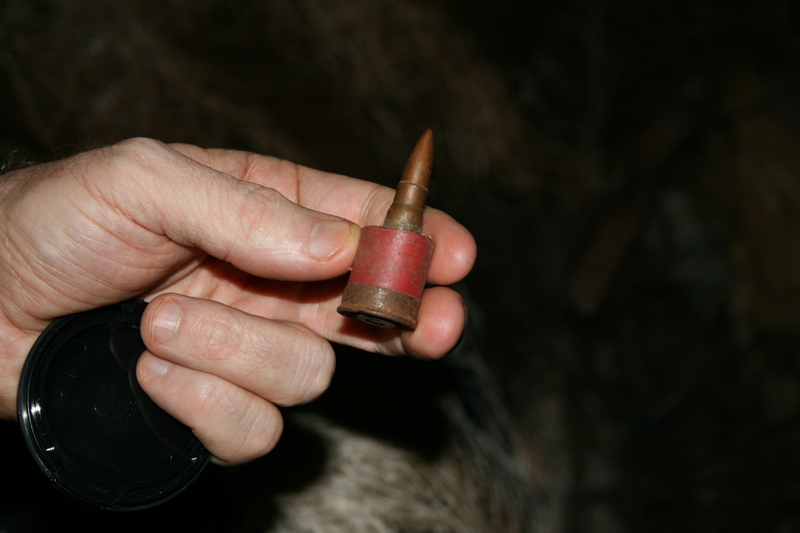 A poacher has devised a way to fire a 7.63x39mm AK-47 round in a 12-gauge shotgun. Not at all accurate or safe, but clever! 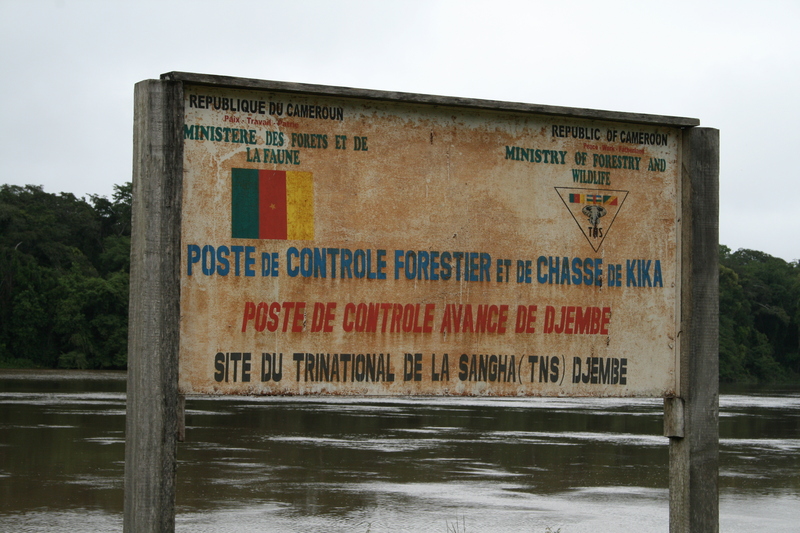 Government sign announcing TNS conservation area along Sangha River, Cameroon. 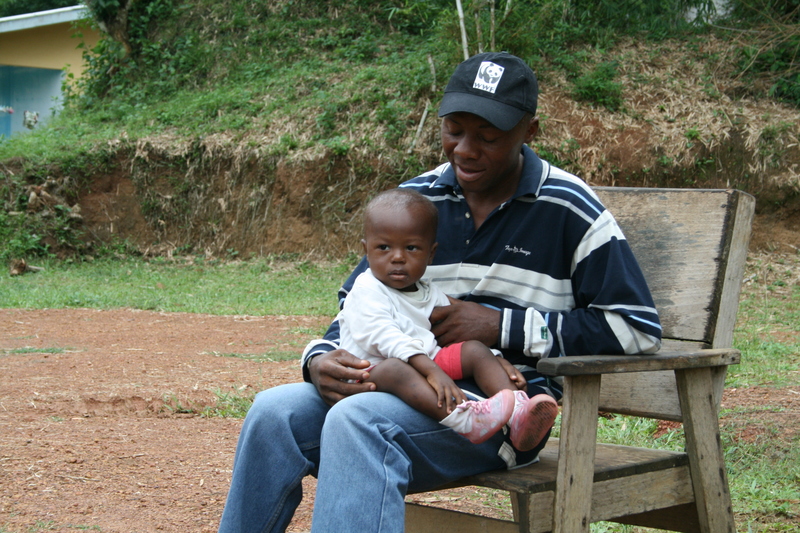 WWF Cameroon project staff with a small child. A path into the national park. Keeping the roads clear is a constant challenge. WWF Cameroon Land Cruiser project vehicle. Conditions are harsh and vehicles take a beating. The Land Cruiser is ubiquitous in most of Africa. 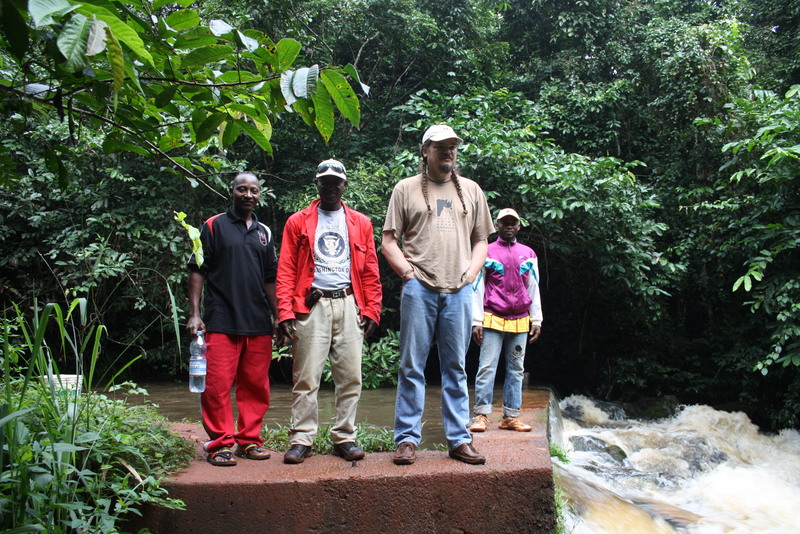 Me with WWF Cameroon project staff. This dam was once used to generate electricity for the camp but the hydroturbine is long gone. 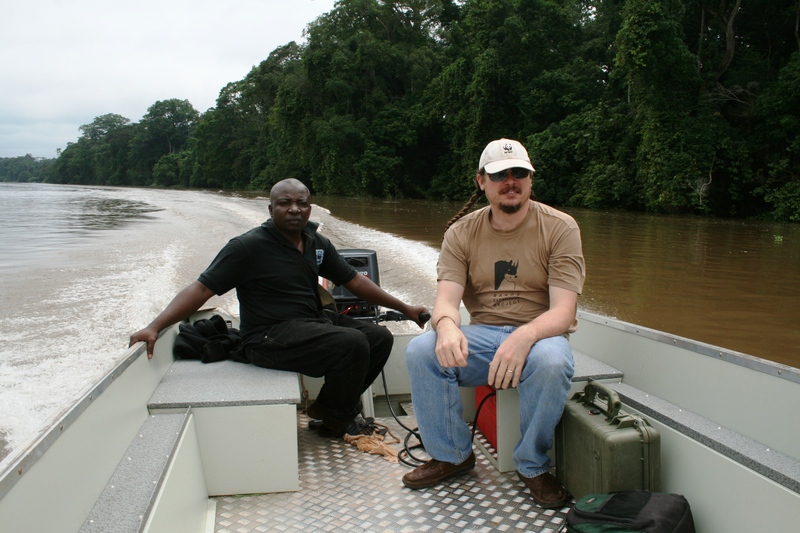 Crossing the Sangha River into Central African Republic. There are few roads and even fewer bridges in this part of the world. Rivers are a vital transportation network. 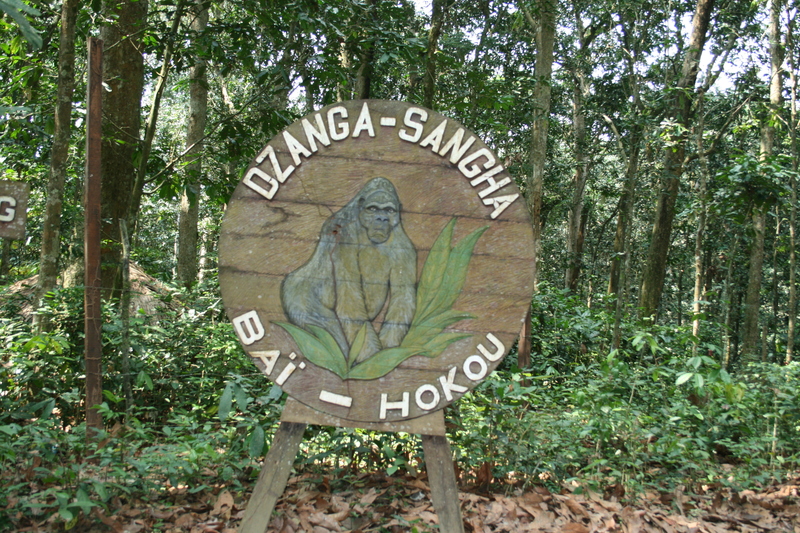 Bai-Houkou, part of the Dzanga-Sangha Protected Areas Complex. 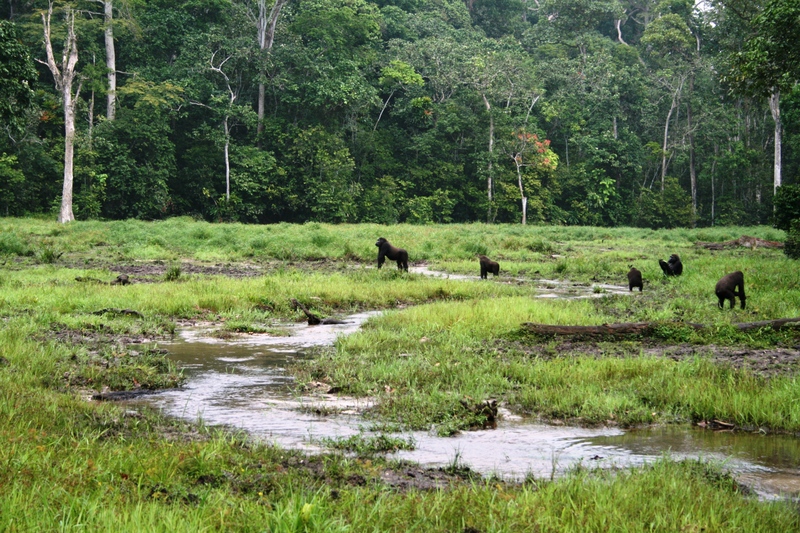 Site of some of the only habituated lowland gorillas in the world. 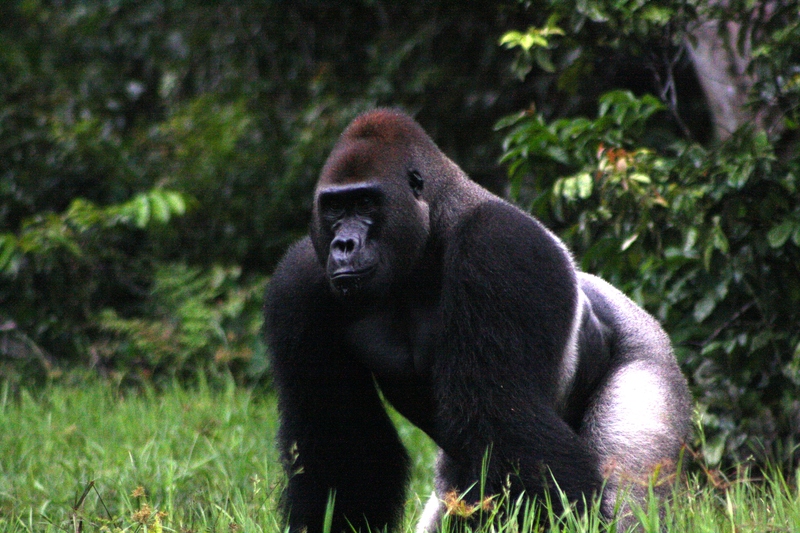 Makumba, the silverback of one of the groups of gorillas habituated for tourism in Bai Houkou. Makumba eating plants. 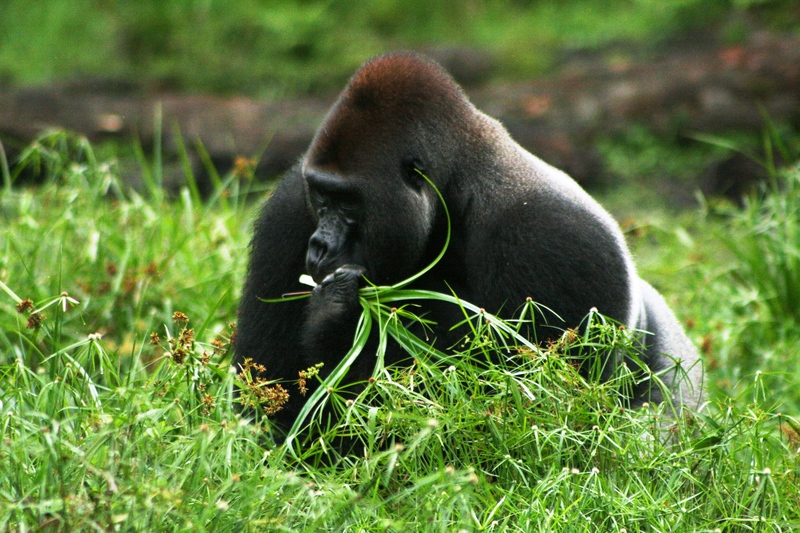 Gorillas are vegetarians and must eat a huge amount of plant material each day. 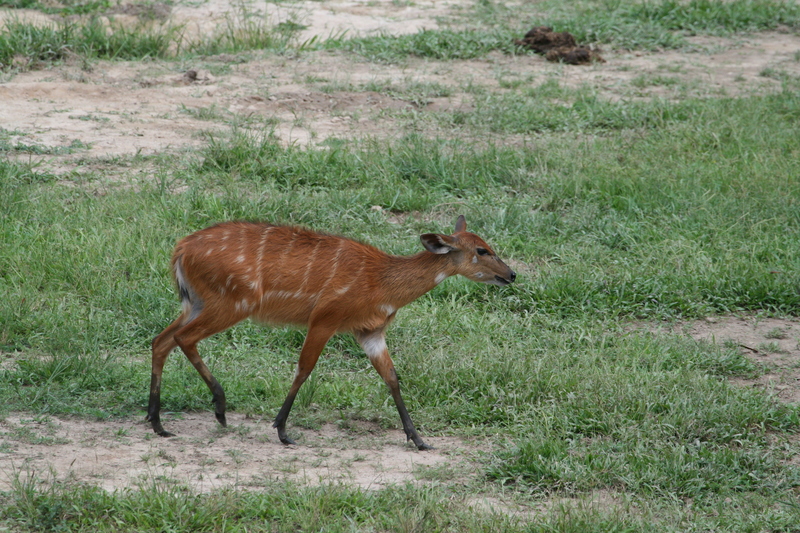 Their days are spent foraging and they can cover large distances. Makumba the silverback. 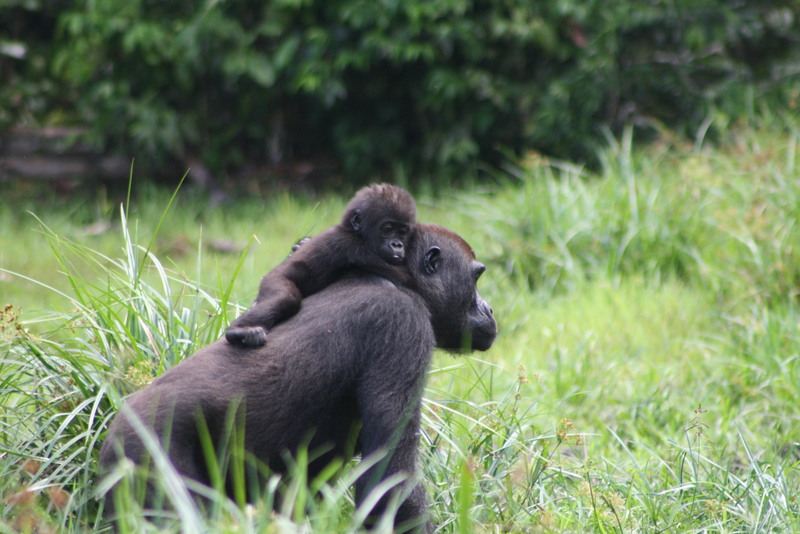 A silverback is a mature male whose name derives from the silver/gray hair covering his backside. 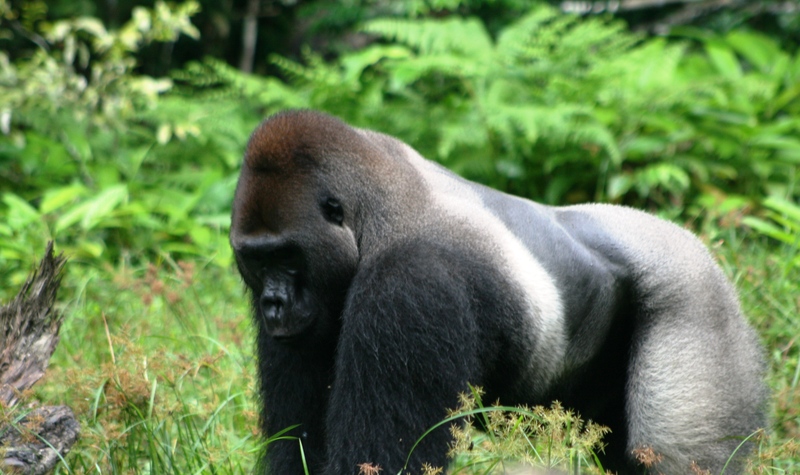 Contrary to what some people believe a silverback is not a type of gorilla, but merely a term for a mature male. Young males are likewise known as blackbacks. 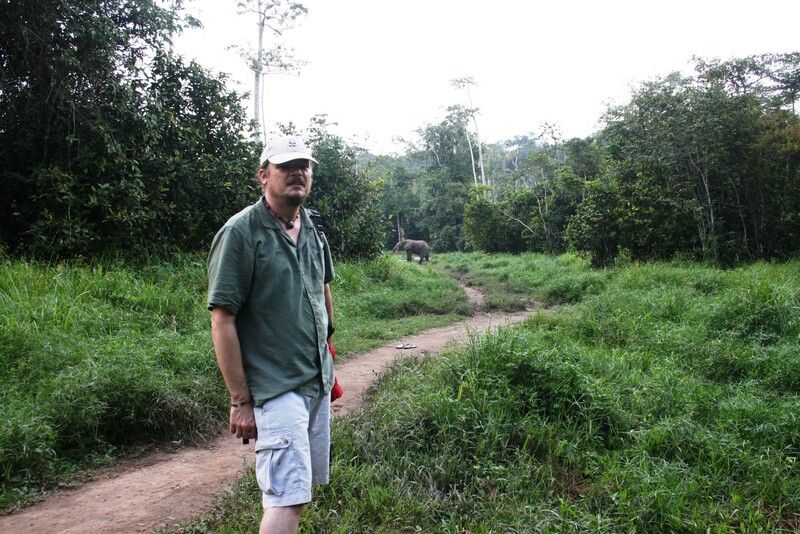 A forest elephant blocks our path on the way to Dzanga Bai. 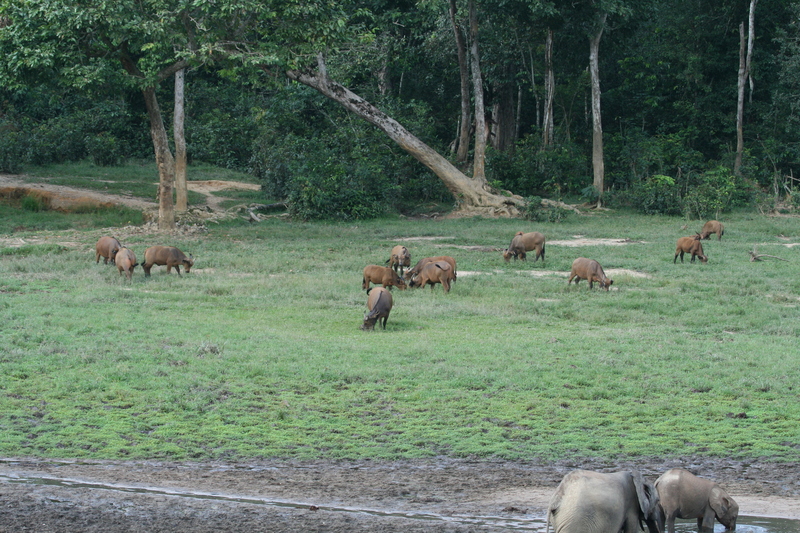 Forest elephants are especially dangerous when encountered at close range in the forest. 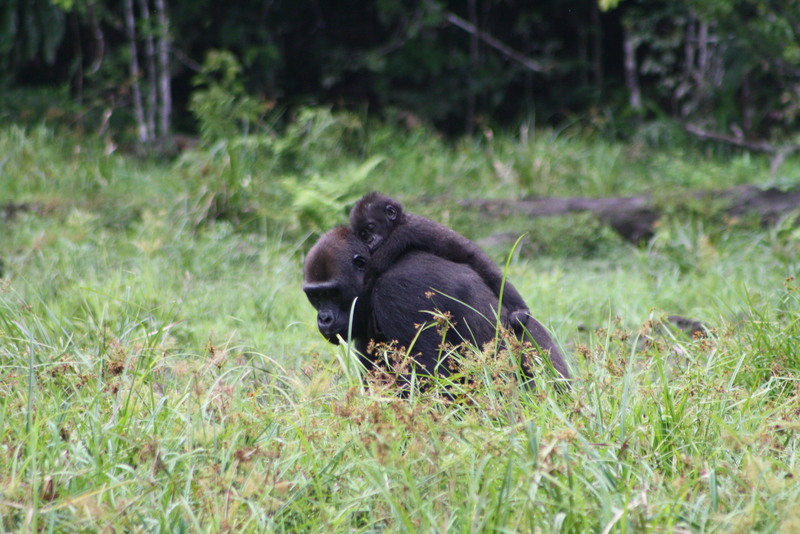 An infant gorilla on her mother’s back. 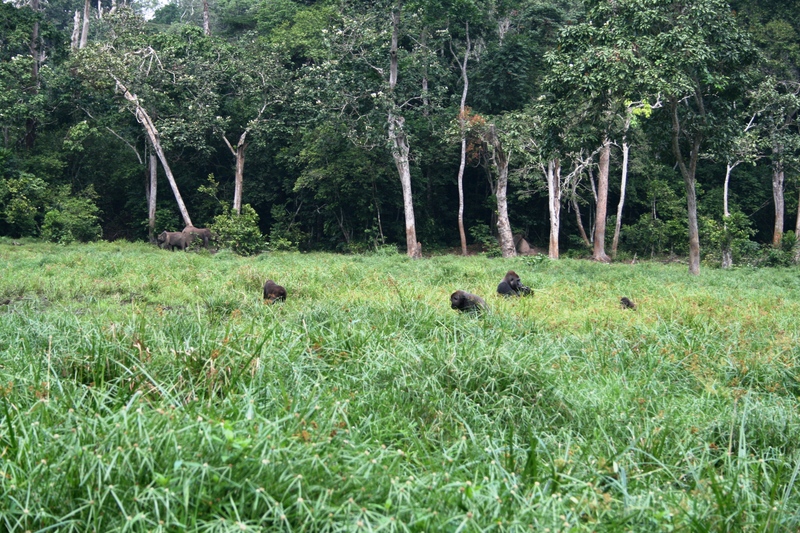 Lowland gorillas in foreground, forest elephants in background. 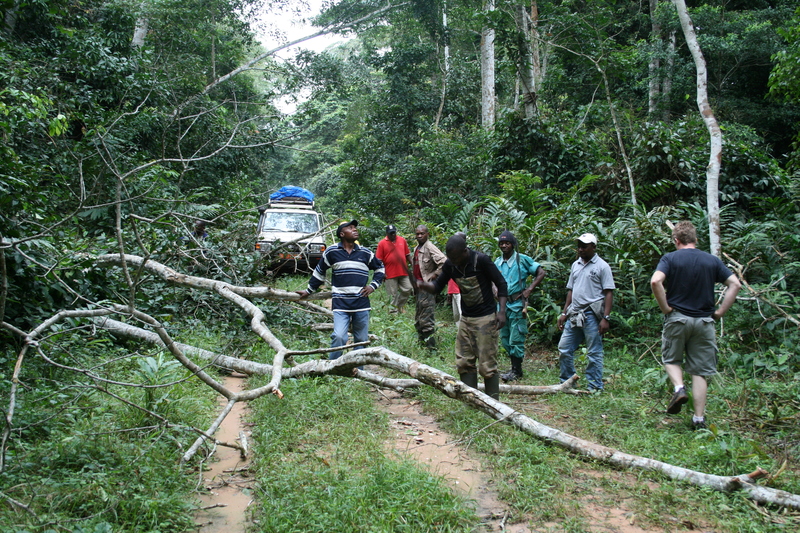 In a small clearing at Bai Houkou, Central African Republic. Very near the border with Republic of Congo. 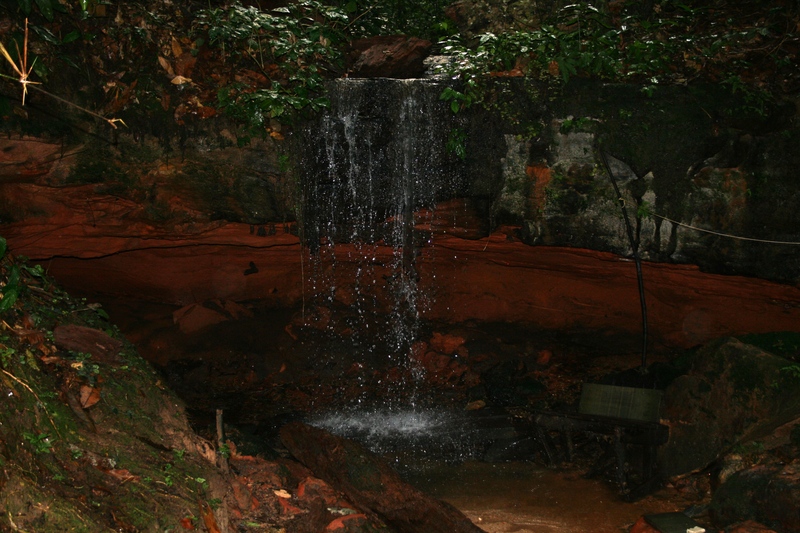 This waterfall serves at the shower for the researchers and conservationists at Bai Houkou. The water is cold and refreshing. 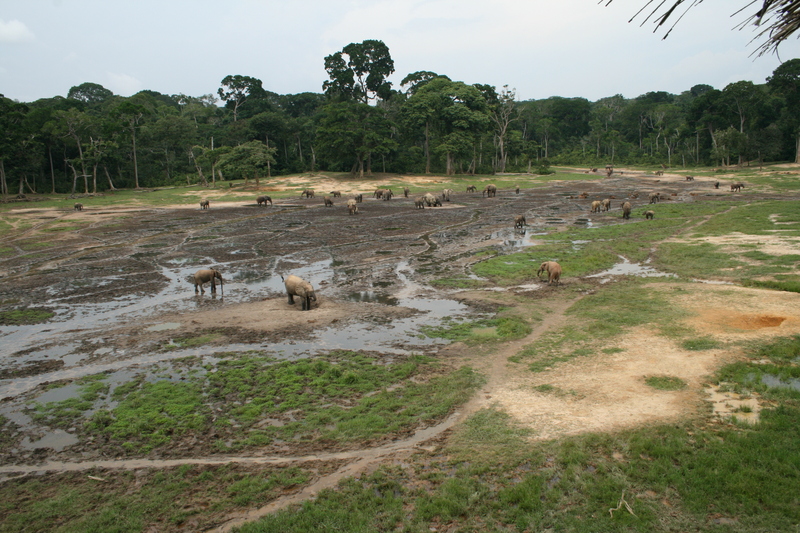 One of the largest bais (forest clearings) in Central Africa is Dzanga Bai, which has been the site of continuous research on forest elephants for decades. 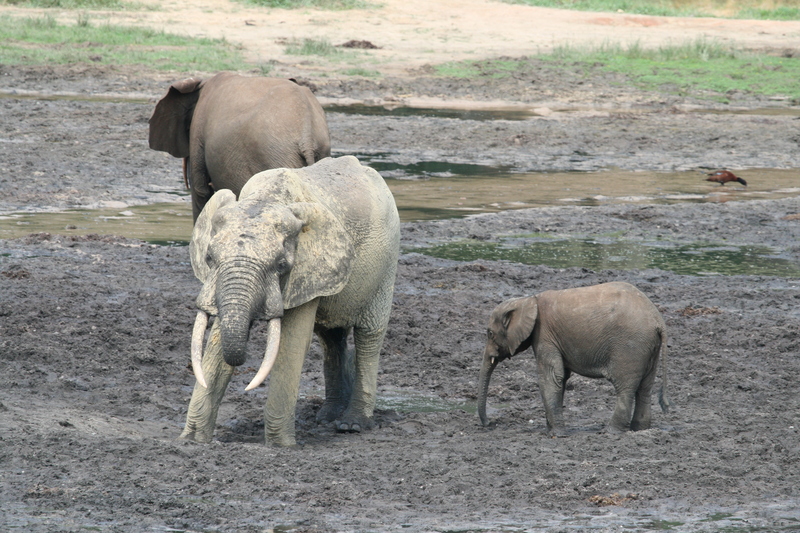 Elephants travel from hundred of kilometers away to visit the bai for its minerals. 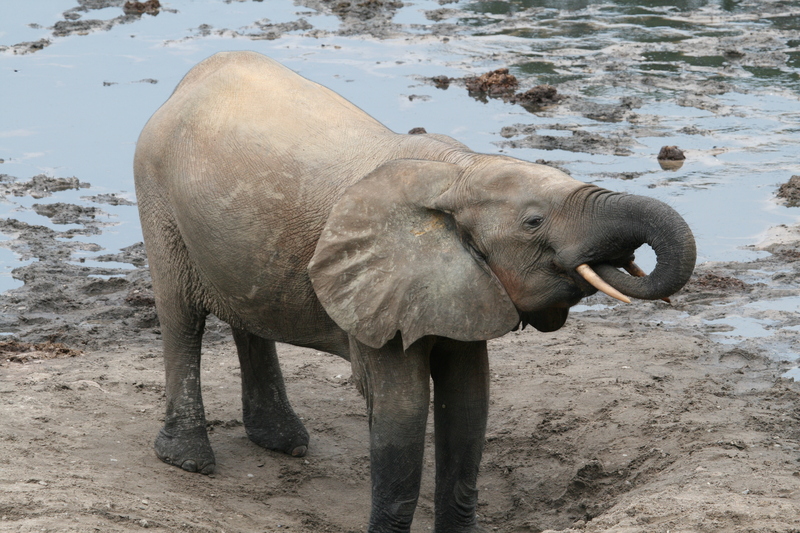 Elephants come in a variety of colors depending on the color of the mud they have coated themselves with. This elephant had found some white mud. 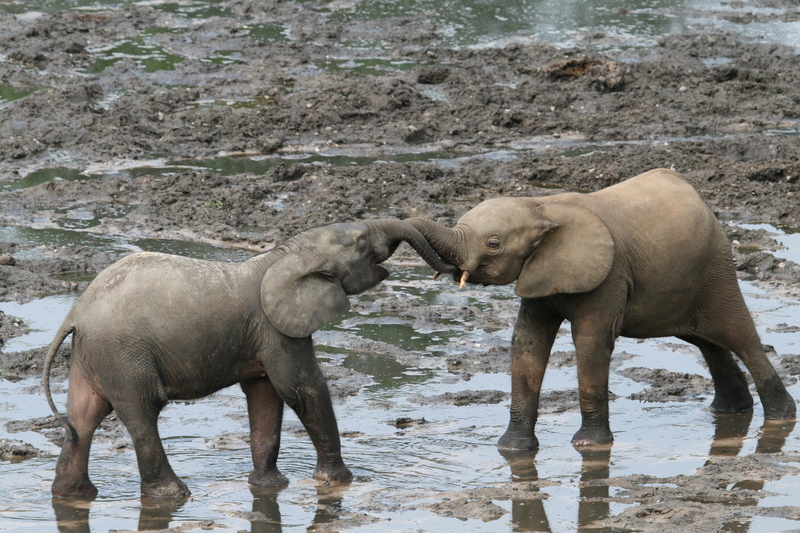 Two young forest elephants playing at Dzanga Bai, CAR. 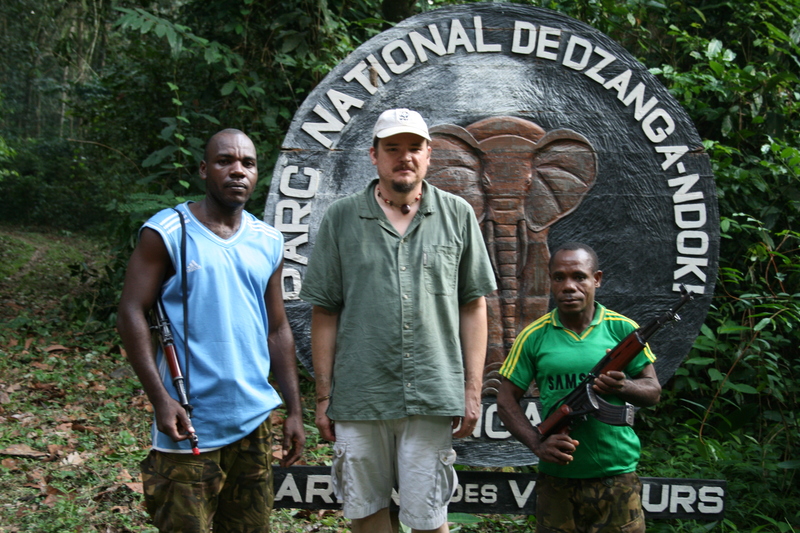 With some of the rangers who protect Dzanga Bai. Many rangers and park staff are recruited from the indigenous Bayaka, or pygmy people of the area. 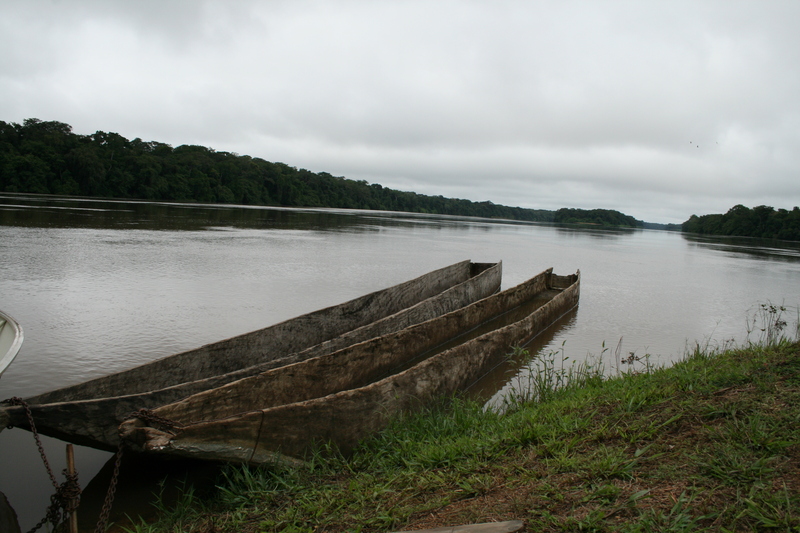 Dugout canoes on the Sangha River.